Q: According to reports, on November 23, Myanmar and Bangladesh signed a memorandum of understanding (MOU) on repatriation of the displaced people fleeing from the Rakhine State. The Bangladesh government said in a statement the same day that Myanmar agreed to launch the relevant work in two months. How do you comment on this? A: We always support Myanmar and Bangladesh in properly resolving the relevant issue through dialogue and negotiation. Over the recent time, after rounds of interactions between the two sides, the situation on the ground at the Rakhine State was remarkably eased, and the two sides also signed a MOU on repatriation. 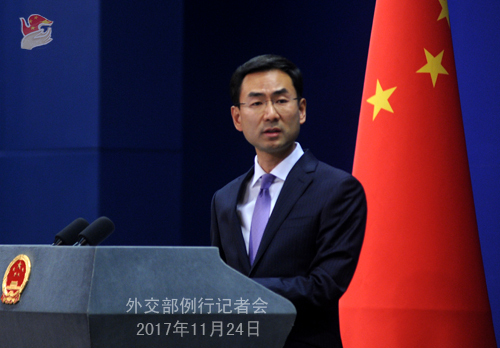 China is delighted to see and welcomes the current positive progress. Recently, Foreign Minister Wang Yi proposed a three-phase solution to the issue of the Rakhine Sate during his visit to Bangladesh and Myanmar. In the first phase, the on-site ceasefire is called for and social stability should be resumed. In the second phase, Myanmar and Bangladesh should find out feasible approaches to this issue through friendly negotiation and reach an agreement on repatriation and implement it as soon as possible. In the third phase, the international community should increase supports and inputs for poverty alleviation in the Rakhine State so as to promote development through poverty alleviation and achieve stability through development. Both Myanmar and Bangladesh agreed to this. By far, the goal of the first phase has been achieved basically, and the latest information shows progress has been made for the second phase. We hope Myanmar and Bangladesh will work together to consolidate the current positive momentum, strengthen bilateral communication and friendly negotiation, work for the early kickoff and smooth operation of the repatriation. As a friend of both Myanmar and Bangladesh, China is willing to continue with its constructive role for the proper settlement of the Rakhine State issue. Moreover, we hope the international community will create favorable conditions and environment and play a constructive role for the settlement of the issue. Q: Yesterday Spanish media published an article about cyber attacks the Spanish Foreign Minister suffered in 2015. The report said it was made by a group of attackers from China. Can you confirm it and what is your comment? A: China firmly opposes and cracks down hard on all forms of cyber attacks. The channel for communication on cyber security between China and Spain is unimpeded. I would like to stress that cyber security is a global issue that calls for joint efforts from the international community on the basis of mutual respect, equality and mutual benefit and through dialogue and cooperation. 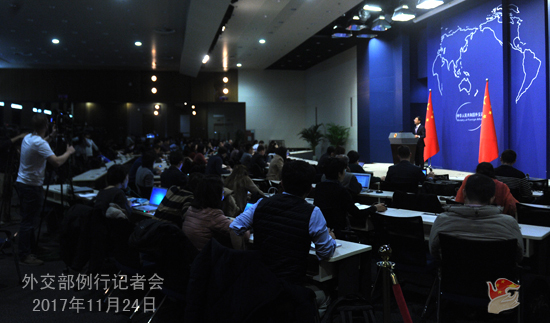 China opposes groundless accusations on the issue of cyber security. Q: Japanese newspaper reported today that China plans to close the friendship bridge that links China to the DPRK in Dandong for ten days for repair. Can you confirm whether it is true? Is it designed in any way to put pressure on the DPRK government over its nuclear program? A: As far as I learn, the China-DPRK friendship bridge will be closed temporarily in the near future for repair work on the bridge floor by the DPRK. It will be reopened after the repair is finished. Follow-up: When did you close it and how long it will be closed for? A: According to what I know, it is closed temporarily in the near future. Q: Do you think the agreement between Bangladesh and Myanmar is a result of China's diplomacy and the three-phase solution proposed by Foreign Minister Wang Yi? A: Days ago, Foreign Minister Wang Yi paid a visit to Bangladesh and Myanmar, during which he proposed a three-phase solution to the issue of the Rakhine Sate. I just briefed you on that and am not going to repeat it. I would like to stress that both Myanmar and Bangladesh have agreed to this solution. In the meantime, we have kept saying that the Rakhine State issue will be properly and fundamentally resolved only through the friendly negotiation between the two sides. As a friend to both the two sides, China is willing to play a constructive role to this end. 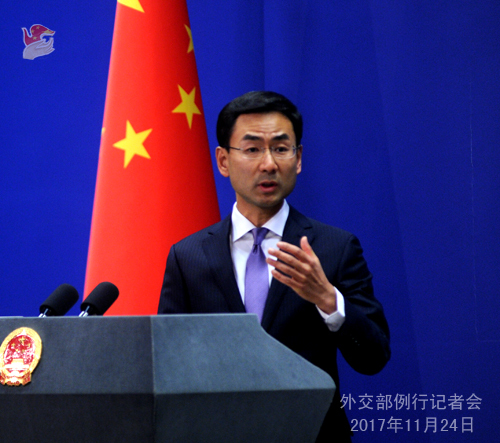 Q: Yesterday the Spokesperson made remarks on the content of Australia 's foreign policy white paper relating to the South China Sea issue. Do you have more comment on its content with regard to China's development and China-Australia relations? A: Like what you said, my colleague remarked on the part concerning the South China Sea issue in that foreign policy white paper, so I won't restate that. We have noted that the white paper said the sustained development of Chinese economy is an important opportunity to Australia. Australia is committed to a strong and constructive comprehensive strategic partnership with China and welcomes a bigger role by China in international and regional affairs. We welcome these remarks. Both China and Australia are important countries in the Asia-Pacific region. Deepening China-Australia relations conforms to the fundamental interests of the two peoples and is conducive to peace, stability, development and prosperity of the region and beyond. This year marks the 45th anniversary of the establishment of diplomatic ties between China and Australia. Taking this as an opportunity, we are willing to work with Australia to continuously enhance political mutual trust, expand mutually beneficial cooperation, properly handle differences and sensitive issues, and promote the sustained, sound and steady development of our bilateral relations. Q: According to reports, the United States and the Republic of Korea will hold an annual military drill on December 4th through 8th. What is your reaction? A: As we said multiple times, the situation on the Korean Peninsula remains complex and severe. We hope all the relevant parties will exercise restraint and refrain from actions that may escalate the tension on the Peninsula. We hope various parties will jointly work to bring the Korean Peninsula nuclear issue back to the right track of peaceful settlement through dialogue and negotiation.